Like many of you, I started photography learning to shoot and process black and white in high school. It was amazing to see a photograph materialize in the chemicals, and it was incredible how much detail I could see in the scenes. Back then I only shot 35mm Tri-X film, but the tones and contrasts were captivating. Now, using tone mapping on a single image I can get similar tones. The details Aurora HDR 2019 can reveal are incredible. I’ll use this panorama from Montana to show demonstrate. I shot it with a 200mm lens on my Lumix G9. When you launch Aurora HDR and open your single photo, it’ll automatically tone map the picture, which will selectively and intelligently brighten the dark areas and bring the brightest areas down. Immediately, your picture will look much better. You can see how much richer the tones and colors are in mine. 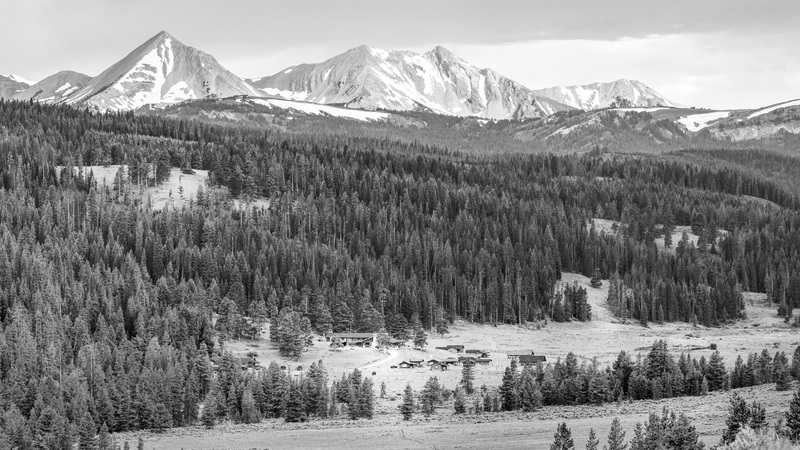 There are two ways to convert this to black and white in Aurora HDR 2019. First, you could simply go to the color filter and slide the saturation slider to zero. Then you could use the various contrast tools and get a pretty good result. The other way allows you to be more specific with the contrast based on the colors in the scene. Go down to the HSL filter, and use each of the Hue, Saturation, and Luminance sections to create your black and white with great contrast. Starting with Hue, you can reduce the color range of the picture. Here, I’ve pushed the magenta, purple and aqua sliders so that they are all bluer, and pushed the other sliders so they are all more orange. The resulting color picture doesn’t look terrific, so go to the Saturation section and push all the sliders to the left. The difference between desaturating here and using the color filter to desaturate is that in the HSL filter the app can still remember what the colors were before they were desaturated, which is important in the Luminance tab. Now that we’ve desaturated the picture, you can think of Luminance as brightness and the Luminance section gives you control over the brightness of each color. Moving each slider will change the contrast of the photo very selectively. After a little tweak to the Smart Tone slider in the HDR Basic filter, it’s time for the Adjustable Gradient. It’s basically just a gradient filter, but you can adjust both top and bottom separately I set the Top half near the top of the picture and brightened the Highlights, darkened the Shadows, and increased the overall Contrast. A black and white photo needs areas that are distinctly white, and this helped the snow have a little more punch. The subject of this photo is my client’s ranch near the bottom of the frame. You can use contrast to focus attention on particular areas in a black and white photo. Just like in the darkroom in high school, Aurora’s Dodge & Burn filter lets you selectively brighten (dodge) and darken (burn). Click Start Painting and then make adjustments to the brush’s density in the top tool panel. I recommend setting the density very low, like 15%, so that you can more gently dodge and burn. Use short strokes, too so that you can undo each stroke if you go a little overboard. You can see that I’ve gently brightened the fields around the ranch and darkened the sky a little, too. One of Aurora’s finest features is the HDR Enhance filter. Somehow, it allows you to tweak details with more finesse than other tools. And the Smart Structure is truly amazing. A great way to use this filter is to start by making a new adjustment layer so that you can apply details to specific areas. for instance, you might like what it does to the trees in a picture, but the sky looks too grainy, so you can use the Layer Brush and remove the effect from the sky. Or add more to the foreground or any place in the picture. It’s a liberating way to work and so easy. After cropping, I’m ready to finish this off by focussing attention into the photo with a dark vignette. Since I’ve started using Skylum tools, I’ve got a new procedure for vignettes. In Lightroom, the vignette is always around the center and you only do it once. But in Aurora HDR 2019 and Luminar, you can place the center of the vignette’s effect anywhere you like and you put as many vignettes on as you like. That allows you to control the gradient of the vignette with a great degree of finesse. Place the first vignette so it surrounds your subject. Darken it all the way so you can clearly see it’s placement, then reduce the Amount to something more subtle. Add another adjustment layer. The second vignette goes around the very edges and is also very gentle. Here are the settings I used for the two. Contrast and detail mean everything to black and white photos. You’ll find that Aurora HDR 2019 can help you make the most of your picture. Remember to use selective desaturation and the adjustment layers to apply details and contrast in specific areas. It’s fun using Aurora HDR 2019 to create the kinds of effects I loved in high school…though I’m hoping that I’m a little more skilled than I was then. I know you’re going to enjoy working in black and white with Aurora HDR 2019. Photofocus readers get special savings on Aurora HDR 2019 the comes with a bundle of training videos, Looks, and LUTs by clicking this link.